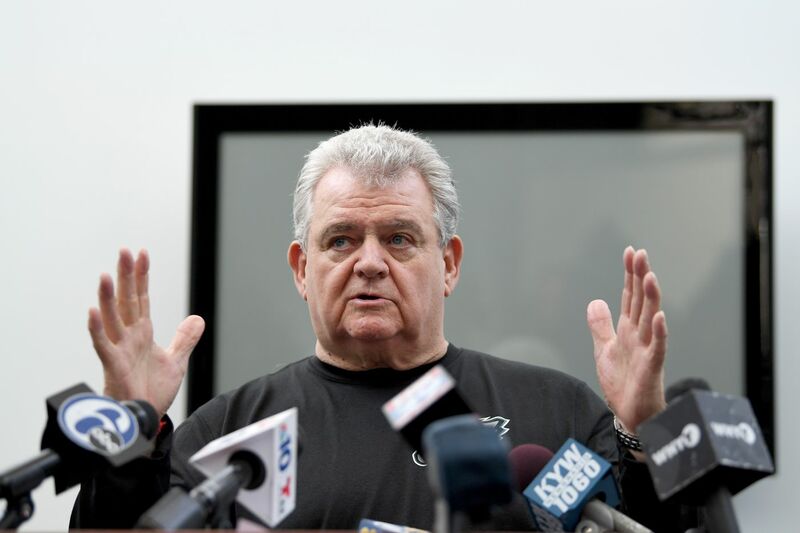 Bob Brady, leader of Philadelphia's Democratic Party, said Tuesday that nominating petitions turned in for a number of judicial candidates were "atrocious," filled with fake signatures and other flaws. He is shown in this file photo announcing his retirement from the U.S. House in 2018. Petition challenge season started at 5 p.m. Tuesday officially. But the usual panic began even earlier. Former U.S. Rep. Bob Brady, chairman of the Democratic City Committee, said he advised several candidates for Common Pleas and Municipal Court judgeships to inspect the signatures on their nomination petitions after hearing about serious problems with them. Brady said the candidates all hired the same political consultant, Rasheen Crews, to help collect the 1,000 signatures from registered Democrats needed to gain a spot on the May 21 primary ballot. Tuesday was the deadline for legal challenges to nominating petitions. Brady said the petitions “were atrocious,” and appeared to be what are known as “kitchen-table jobs,” when people fill in the names of voters who did not actually sign the petitions. Brady also said some of the petition packages had what appeared to be photocopied pages from other petitions, which is not allowed. Crews, who Brady said was paid $2 to $3 per signature, did not respond to requests for comment. Crews also worked for other candidates, collecting petitions for Mayor Jim Kenney and one of his Democratic primary challengers, former City Controller Alan Butkovitz. A spokesperson for former Lt. Gov. Mike Stack III’s campaign for City Council at large said Crews collected 40 percent to 50 percent of its petitions. Brady said he spoke to Crews on Monday evening and the consultant blamed any problems on people he hired to circulate the petitions. This creates a quandary for the local Democratic Party, which is scheduled to consider which judicial candidates to endorse next Monday and Tuesday. ”How can we endorse someone if they have fake petitions?” Brady asked. Wanda Murren, a spokesperson for the Pennsylvania Department of State, said nomination paperwork for three judicial candidates from Philadelphia was rejected last Tuesday after a man showed up in the Harrisburg office “just a few minutes” before the filing deadline of 5 p.m.
One, Common Pleas Court Judge Timika Lane, was rejected in her bid for Superior Court because she did not have the required number of signatures. Another, Brian McLaughlin, was rejected in bids for Common Pleas and Municipal Courts for the same reason. The third, Gary Silver, was rejected for Common Pleas Court because his candidate affidavit was not notarized. Murren said Silver has gone to court to appeal that rejection. McLaughlin and Silver used Crews for petitions, Brady said. It was unclear whether Lane did. He declined to say how many signatures Crews gathered for him or whether he would seek damages from Crews. James Berardinelli is one of the several judicial candidates who also hired Crews to collect signatures. In a brief interview Monday, Berardinelli said that Crews collected about half of the signatures he turned in but that he didn’t think his were fraudulent. “Looking at mine, I don’t think they were photocopied,” he said, noting that he was in Crews’ office last Monday as circulators were coming back from the field with signatures. Berardinelli is running for both Municipal Court and Common Pleas Court. He said Crews collected about 900 of the 1,740 signatures he filed for Common Pleas and 600 of the approximately 1,600 he collected for Municipal Court. Berardinelli said he used Crews in 2017 and didn’t have an issue then. “Obviously the allegations are concerning,” he said.